New Version of FileMorph Document Converter! 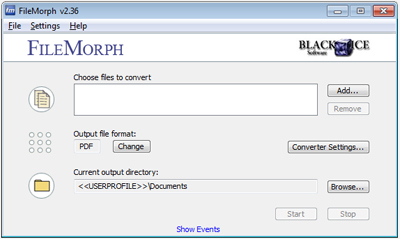 Black Ice Software has just released the FileMorph version 2.40 with the new PDF write module to improve document conversion to a PDF file. The FileMorph version 2.40 includes major improvements for font embedding and font management to reduce file sizes, better Asian character support, as well as the significant improvements to the PDF file quality. The PDF write module hasn't been updated since 7-30-2009 and it has been completely replaced. Customers with Version 2.30 can upgrade for free. Customers with a valid maintenance subscription can also receive the most recent upgrade for free. Please contact impactsales@blackice.com with your serial key.